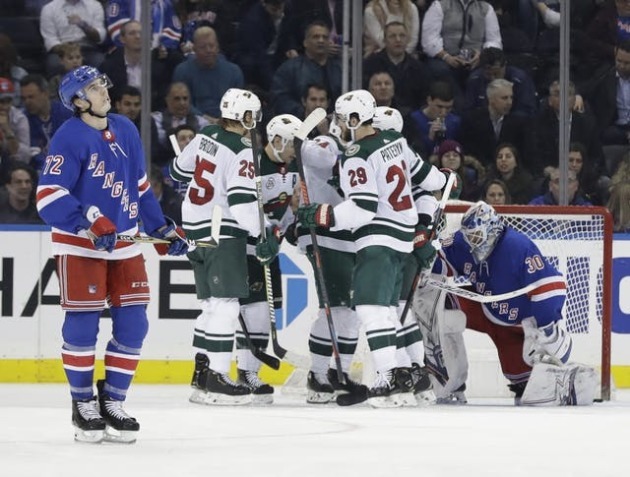 The Wild snapped a five-game skid the last time it played the Rangers, and it’ll be looking to end a similar slide Saturday when it hosts New York at Xcel Energy Center. A 4-1 win over the Rangers Feb.21 on Broadway was the start of the Wild’s recent eight-game point streak, and another run like that would certainly go a long way in helping the Wild climb back into a playoff spot. The team is three points behind the Coyotes for the second wild card spot in the Western Conference. Arizona hosts the Edmonton Oilers Saturday. This is the Wild’s first chance to atone for a listless showing Thursday in a 4-1 loss to the Dallas Stars on home ice. That dropped the Wild to 0-2 on its current five-game homestand, which picks up this weekend. After hosting the Rangers, the Wild will get back in action Sunday against the New York Islanders. Goalie Devan Dubnyk will start against the Rangers, and Boudreau will decide who will handle Sunday’s game after seeing how Saturday goes. 9: Points for winger Jason Zucker in his last 10 games. 1: Power play goal for the Wild in its last 19 tries. 14: Goals with the man advantage from the defense. 6-4: Record for the Wild vs. the Rangers in the last 10 games at Xcel Energy Center. 99: Career points for winger Kevin Fiala. New York lost its third straight Friday night in Calgary, falling 5-1 to the Flames. That dropped the Rangers to 11-19-5 on the road with one final test to go on their four-game road trip. Still, the team has rallied from a two-goal deficit to at least tie the game five separate times over the last 10. Goalie Henrik Lundqvist has made at least 30 saves in six of his last nine appearances. Center Mika Zibanejad leads the Rangers in goals (27), assists (39) and points (66).